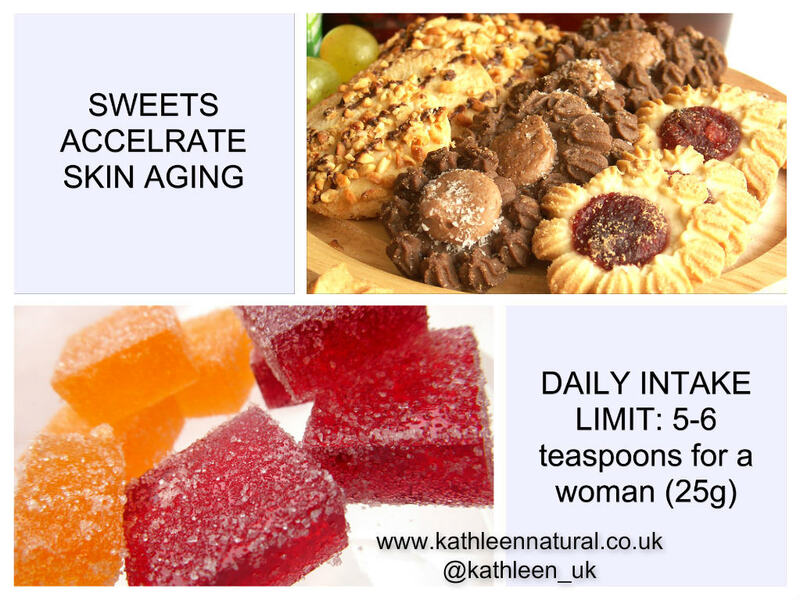 There is a direct relationship between high-sugar diet and skin aging! Harmful AGES have taken up the precious collagen from our body in a domino-like reaction. Collagen is a natural type of protein which makes up over 80% of a person’s skin, working like a ‘glue’ and ‘scaffolding’. Therefore, AGES further reduce the level of collagen leading to dry, wrinkles and sagging looking skin. AGES also affect what type of collagen we have. Our skin contains 3 types of collagen (types I, II, and III) and type III are the most stable and longest lasting. AGES will transform type III collagen into type I, which is more fragile. Nevertheless could we completely eliminate all types of sugar from our diets? We should not! Sugar is an essential fuel for cells and energy metabolism, critical to survival. However, here are the tips to reduce or slow AGES. Tips #1: Limited your daily added, or ‘free’ sugars to 5% of your daily calorie intake, equals to five-six teaspoons (25g) for women and seven-eight teaspoons (35g) which is the recommendations from the World Health Organisation. Tips #2: Avoid fizzy drink which contain around 9 teaspoons of sugar! Tips #3: Avoid high-fructose corn syrup (a common additive sweetener in processed food) which is 10 times faster formation of AGES. Check labels for ingredients list! Tips #4: Minimize intake of carbohydrates. Tips #5: No more fast food. Tips #6: Eat more antioxidant-rich foods; fruits e.g grapes, berries, especially dark-colored ones; nuts e.g. walnuts; dark green vegetables. Tips #7: Replenish the skin with antioxidant-rich ingredients, coenzyme Q10, green coffee extract, algae extract, sunflower seed oil, apricot kernel oil, sandalwood extract, Vitamin E, hyaluronic acid and cranberry extract. Tips #8: Remember sun protection. Thanks so much for reading my post. If you like this post, you may also like Olive Oil: Taste & Health, Skin Care Routine and Unlock the Secret of Coenzyme Q10.